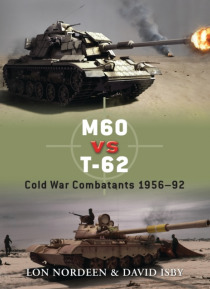 Designed for the battlefields of Europe at the height of the Cold War, the M60 and T-62 were the premier combat tanks of their day. However, it was in the deserts of the Middle East that they finally met in battle. This new Duel title examines the design and development of these main battle tanks, identifying their strengths and weaknesses, and describing and analyzing their performance on the bat… tlefield during the Yom Kippur War, the Iran Iraq War, and the first Gulf War.